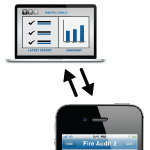 SBN’s mobile checklist software started with an iPhone checklist application for safety professionals. Our solution was designed to allow safety professionals to capture information electronically on their iPhone or mobile smart device right from the field, but a checklist is a checklist is a checklist. Our iPhone checklist applications can be used by any industry. It can even be used in the home to keep fire alarm battery replacements and air conditioning filter replacements on schedule. 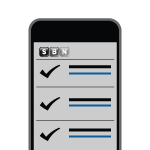 At SBN, we have designed our mobile checklist software to be easy to use. Program managers or administrators can create custom checklists for whatever they need to inspect. Individuals in the field equipped with a mobile smart device can pull up the checklist and complete it. They can even view the history for the area or item they are inspection. Photos and field notes can be incorporated, and safety deficiencies or other exceptions that may require future follow up can be documented. The completed checklist can then be emailed to stakeholders, and with proper configuration, existing databases can be updated.